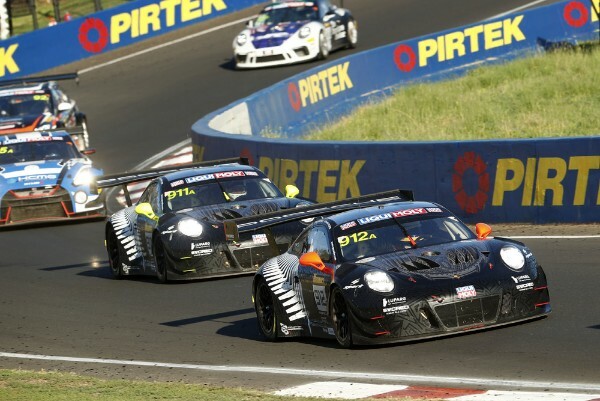 Porsche claimed a thrilling victory in Intercontinental GT Challenge Powered by Pirelli’s season opener at the Liqui-Moly Bathurst 12 Hour earlier today courtesy of Earl Bamber Motorsport’s Matt Campbell, Dirk Werner and Dennis Olsen. Aston Martin finished second overall but it was Mercedes-AMG that completed the Intercontinental GT Challenge podium following a nail-biting fight between GruppeM Racing and Team Vodafone over the closing stages. Porsche’s first series and Bathurst victory came on a record-breaking day at Mount Panorama where more laps – 312 – were completed than at any previous Bathurst 12 Hour. 49495 fans also attended over the four days, an increase of 7885 compared to last year’s total, while five manufacturers finished inside the top-six. It was also the outgoing 911’s final outing as Porsche’s frontline GT3 model. However, even those statistics were overshadowed by a race for the ages that was only decided in the final 10 minutes. EBM’s two Porsches had remained a constant presence inside the top-10 over the first eight hours but finally hit the front when their alternative strategy, aided by the event’s longest-ever period between Safety Cars, began to play out. #911 initially led the team’s challenge but when it retired with a power steering issue the sister #912 was perfectly placed to maintain Porsche’s challenge. Changing tyres at the final pitstop initially dropped local hero Matt Campbell to fourth and seemingly out of contention, but as those ahead on older rubber faded so the Australian began to make headway. He was up to third when the eighth and final Safety Car was called with just 30 minutes remaining, which set up a late-race showdown between the seven cars still on the lead lap. Campbell wasted no time relieving Raffaele Marciello’s GruppeM Mercedes-AMG of second but found Jake Dennis’ R-Motorsport Aston Martin harder to pass. That was until the Briton left just enough room for the Porsche to squeeze past on the inside of Elbow Bend with less than 10 minutes remaining. Further back, Marciello’s rapidly deteriorating tyres had given Shane van Gisbergen (Team Vodafone Mercedes-AMG), Chaz Mostert (BMW Team Schnitzer) and Andy Soucek (Bentley Team M-Sport) a sniff of the final overall podium spot. However, the Italian produced a defensive masterclass to hold off all three despite the best efforts of Van Gisbergen who ended up just 0.2s behind. KCMG’s #18 Nissan finished seventh after a late drive-through penalty denied Alex Imperatori a chance to join the podium scrap. Josh Burdon also underlined the team’s pace by claiming fastest lap in the delayed #35 car. Bentley’s second Continental GT3 also had the pace to challenge but was restricted to eighth after slipping off the lead lap. With HubAuto’s Pro class-entered Ferrari hitting trouble early on the manufacturer’s hopes instead shifted to Spirit of Race’s Paul Dalla Lana, Pedro Lamy and Mathias Lauda whose 488 GT3 bounced back from Friday’s practice accident to win the Pro/Am class by finishing ninth overall. On pace alone, Audi Sport Team Valvoline’s two R8 LMS GT3s would have been victory contenders. However, separate incidents for both the #2 and #22 entries ended the manufacturer’s chances of back-to-back Bathurst victories before the halfway mark. Its other Intercontinental GT Challenge nominated entry, the #9 Melbourne Performance Center car, at least salvaged two points for coming home 10th overall and ninth of the Intercontinental runners, while #2 also scored a point. Round two of the world’s only global GT3 championship takes place at the California Laguna Seca 8 Hours on March 28-30. Porsche has won the Bathurst 12 Hour (Australia) for the first time, and has added another chapter to the impressive success story of the Porsche 911 GT3 R in its final performance at a major endurance race. Works driver Dirk Werner (Germany) as well as the two Porsche Young Professionals Matt Campbell (Australia) and Dennis Olsen (Norway) brought the GT3 car fielded by EMB over the line in first place. The fledgling customer team managed by Porsche works driver Earl Bamber (New Zealand) triumphed at its maiden outing on an international stage in the fight against experienced teams from eight manufacturers. In a breathtaking finale on the Mount Panorama Circuit, local hero Campbell ultimately beat his top-league rivals, to the great delight of his fellow compatriots in the grandstands. In the final 20 minutes of the 12-hour endurance race, the Porsche Young Professional picked off three vehicles one after the other and with perfectly-executed manoeuvres swept into the lead with the No. 912 Porsche 911 GT3 R. His teammates, Werner and Olsen, drove strong stints and his EMB team worked flawlessly with a perfect strategy to lay the foundation for this victory. Lady Luck, however, was not shining on their team colleagues Romain Dumas (France), Sven Müller (Germany) and Mathieu Jaminet (France). From the half-way point of the race, the driver trio in the Porsche 911 GT3 R swapped the lead with the sister vehicle over long stretches, however the No. 911 car did not see the finish. With three hours left to go, a problem with the power steering hampered the charge of the fast and consistent GT3 vehicle and forced it into the pits. The Porsche 911 GT3 R fielded by the customer team Competition Motorsport/McElrea Racing retired after an accident of David Calvert-Jones (USA) early on in the race. Jaxon Evans gave an impressive performance at his maiden outing as a Porsche Junior. The New Zealand shared the No. 12 vehicle with works driver Kévin Estre (France) and Calvert-Jones. The identical GT3 car of the Black Swan Racing squad could not contest the race due to an accident during practice. For the opening round of the 2019 Intercontinental GT Challenge 2019, the 2018-spec version of the ca. 500 hp GT3 car was campaigned for the final time, as stipulated by the rules. Included on the Weissach racing car’s extensive list of successes is an overall victory at the Nürburgring 24-hour race as well as titles in the ADAC GT Masters and the North American Pirelli World Challenge. From the second race of the season in Laguna Seca (USA), customer teams will again race the new version of the vehicle, which celebrated its race debut last weekend at Daytona (USA). The new Porsche 911 GT3 R features numerous improvements in terms of driveability, aerodynamics and kinematics. In the Class B of the 12-hour race in Australia, the customer team Grove Racing scored a comfortable lights-to-flag victory. Ben Barker (Great Britain) and the father-son team Stephen and Brenton Grove (Australia) secured first place with the No. 4 Porsche 911 GT3 Cup ahead of the same model vehicle run by the Carrera Cup Asia squad.